Fabricated as per IS: 7320, ourÂ Slump Test ApparatusÂ is used to determine the consistency of freshly mixed concrete. Slump Test Apparatus offered by us comprises of slump cone with top dia. of 100mm, bottom dia. of 200mm & height 300mm. 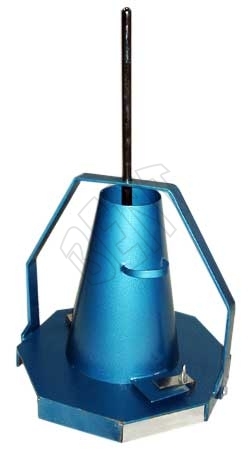 The handles of our Slump Test Apparatus are made of mild steel sheet, chrome plated graduated tamping rod 16mm dia. x 600mm in length, which is rounded at one end, and a hexagonal base plate. We are specialists in providing the best quality Slump Test Apparatus. We ensure easy availability of the Slump Test Apparatus to customers and guarantee 100 percent functionality and durability of the units.